1. Combine oil, vinegar, lemon juice, maple syrup, ginger, and salt in a small bowl; whisk to blend. Set aside. 2. 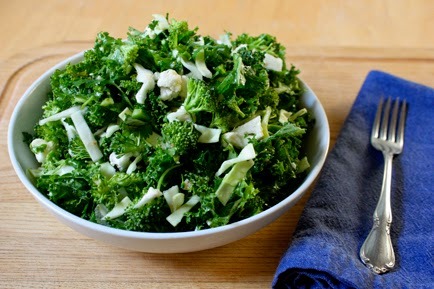 Combine kale, cauliflower, broccoli, cabbage, and cilantro in a large bowl; mix well. 3. Drizzle cabbage mixture with dressing; toss gently to blend. If you start your morning with a cup of coffee, beware of non-dairy coffee creamers – especially the powdered, flavored varieties. These imposters contain no nutritional value, and are filled with toxic additives. They often – ironically – contain dairy by-products and are frequently filled with processed chemicals, hydrogenated oils and artificial flavorings, consequently transforming your daily wake-up drink into a potential heart attack in a mug. They contain cheaper and more easily-dissolved alternatives, including chemical sweeteners, processed oils and stabilizers, with no real cream to be found. Instead, the creamy texture and flavor is provided by processed vegetable oils. While powdered coffee creamers are labeled as ‘non-dairy,’ if you have milk allergy or are vegan, be sure to steer clear. These products are free of lactose, but still often contain casein, a dairy-derived product that may trigger a reaction in those sensitive to milk. Non-dairy creamers may also contain sodium caseinate, a chemically-altered and extruded form of casein, which in its final form is not even considered a dairy product by the FDA due to the sheer amount of chemicals used. Powdered non-dairy coffee creamers frequently contain hydrogenated or partially hydrogenated oils, or, as they are more commonly known, trans fats. Some brands contain up to one gram per tablespoon. Hydrogenated oils are created by adding chemicals agents, sometimes metals such as platinum and nickel, to pressurized and already-processed oils to further alter their molecular structure. Instead of sugar, many non-dairy creamers contain corn syrup or corn syrup solids. Corn syrup solids are produced when corn starch is bathed in hydrochloric acid. For those unfamiliar, hydrochloric acid is an industrial chemical solution with highly corrosive properties that is also used in the manufacturing of plastics. Additionally, the corn itself is often derived from GMO varieties, adding all of the risk factors associated with GMO’s to the toxic brew. If these facts aren’t already scary enough, these imposter creamers often use sodium aluminosilicate as an anti-caking agent. The aluminum in this chemical compound has been linked to cell damage, bone disorders, Alzheimer’s disease and organ damage. Furthermore, the popular television show Mythbusters proved that sodium aluminosilicate is flammable when dispersed. Since when are metals and flammables acceptable in our beverages? 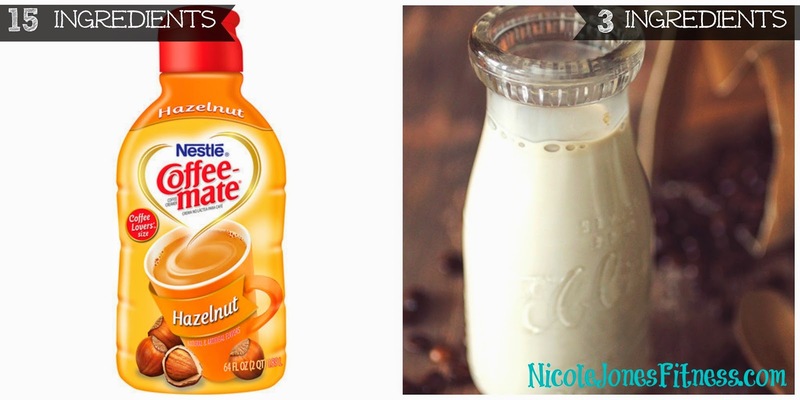 The liquid creamers like in the picture below also contain many chemicals and are just as bad for you. Blend all ingredients in a blender, vitamix, or magic bullet. I also use my hand blender with the whisk attachment. Pour all of the ingredients into your mason jar. Screw the lid on tightly, and shake vigorously for a few minutes until well combined. In all these recipes, anything that has a dry or thick ingredient (like cinnamon, honey, etc..) should be heated up with a small amount of your milk/cream from the base recipe so it can dissolve properly. You don’t want grainy creamer! Next, add the rest of the milk/cream along with the sweetened condensed milk. If you want them really creamy, just use heavy cream instead of milk in your base recipe. Of course that makes the fat content go up so be careful if you are watching your intake. You stick a piece of tape on my mason jar lid with the expiration date from the milk used & have this as a guideline as to when the creamer should be used by. You gotta love a meal that only dirties one dish! And this meal is full of flavor with fresh summer veggies. It's one the whole family can love! 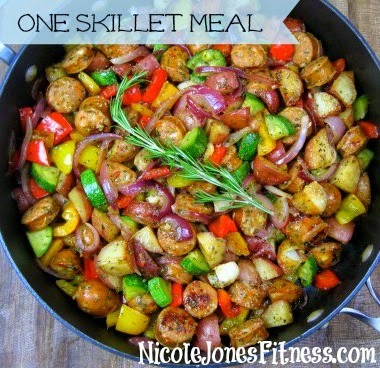 In a large, non-stick skillet with deep sides and a cover, add the potatoes and oil over high heat. Season with salt, pepper, and garlic powder, and toss the potatoes around in the oil and seasonings. Once it starts to sizzle, cover the pan and reduce the heat to low for 25 minutes, flipping the potatoes occasionally so they brown easily. Once tender, remove to a plate or bowl. Add the sliced sausage to the pan and cook for about 10 minutes on medium-low heat, browning on all sides. Remove to the same plate or bowl with the potatoes. Add the peppers, onions, garlic, and rosemary to the pan and season with a good pinch of salt and pepper. Cook for about 7-8 minutes, stirring occasionally, until the peppers and onions are lightly browned. Add the zucchini and cook for an additional 5 minutes. Add the potatoes and sausage to the pan, cover, and cook for a final 5 minutes. Taste for seasoning and serve! Artificial ingredients, preservatives, & harmful chemicals are everywhere in foods these days. And as a mom, I can't stand the thoughts of letting my kids eating all those additives. 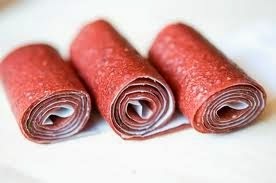 So today I'd like to share a kid favorite, but the healthy alternative, fruit roll ups! Take a look at the ingredient list in General Mills Fruit Roll-Ups: pears from concentrate, corn syrup, dried corn syrup, sugar, partially hydrogenated cottonseed oil, citric acid, sodium citrate, acetylated monoglycerides, fruit pectin, dextrose, maltic acid, ascorbic acid, natural flavor and the following food coloring: blue 1, red 40 and yellows 5 and 6. Which one sounds most appealing to you?! Exactly. This recipe is pretty flexible. You have the freedom to pick one fruit or mix different kinds. You can use fresh or frozen fruit. Below the recipe are some fruit combination suggestions, but feel free to try out your own combos too. I suggest making a few different trays of fruit at the same time because these won’t last long in your house and though they are VERY simple to make, they do take a long time to set. 2. Spread the puree on a oil-sprayed silpat baking mat or parchment paper (BE SURE to spray! If you don’t it will stick!). 1 1/2 cup of fruit puree is enough for 1 baking sheet, and put in the oven on 140°F (or as low as your oven can go. my stove’s lowest temperature is 170). Leave the oven door open a little bit to let the moisture out. You can also use a dehydrator if you have one! Just check your recipe book for heating times and directions. 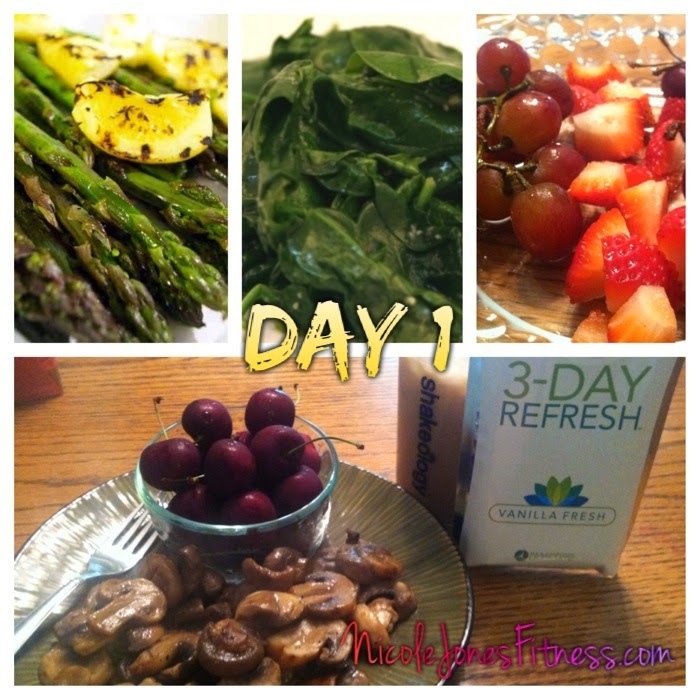 Today I started the 3 Day Refresh. It is a healthy, quick cleanse that is meant to give you a boost to get back on track. Think indulgent weekends and feeling blah, this can get you back to feeling good and eating habits back on track. The Fiber Sweep drink is ok, I am just not a fan of lemon flavor drinks aside from lemonade so I put a few drops of water flavoring in it and it was no problem from there! Only one of those a day in the morning. I can tolerate it for 3 days. The Vanilla Refresh drink was yummy considering you only made it with water. You get 2 of those a day. One at lunch and one at dinner. I got a wide variety of fruits and veggies to pick from which I love, don't feel deprived. I even feel good enough and full enough to go workout in a bit! I'll weigh in the morning and report again at the end of tomorrow about day 2 and any changes I've had. Stay tuned! Day 3 complete! I ate the same things pictured above for all 3 days, I am not one to require large variety each day. There was certainly room for many combos of foods to eat though! Results: I lost 5 lbs and an overall loss of 6 inches! Belly bloat is gone and I'm feeling pretty good! I would most definitely do this again especially after a holiday where one tends to overeat or over indulge. I'd also recommend this for those with a vacation or event coming up and would like to lose the bloat, drop a few lbs and inches. Or if you are ready to jump back into a fitness routine and are way off track, this would be a wonderful kick start to get you started! If you have any questions or would like to chat, please email me at nicolejonesfitness@yahoo.com I'd be happy to assist you! 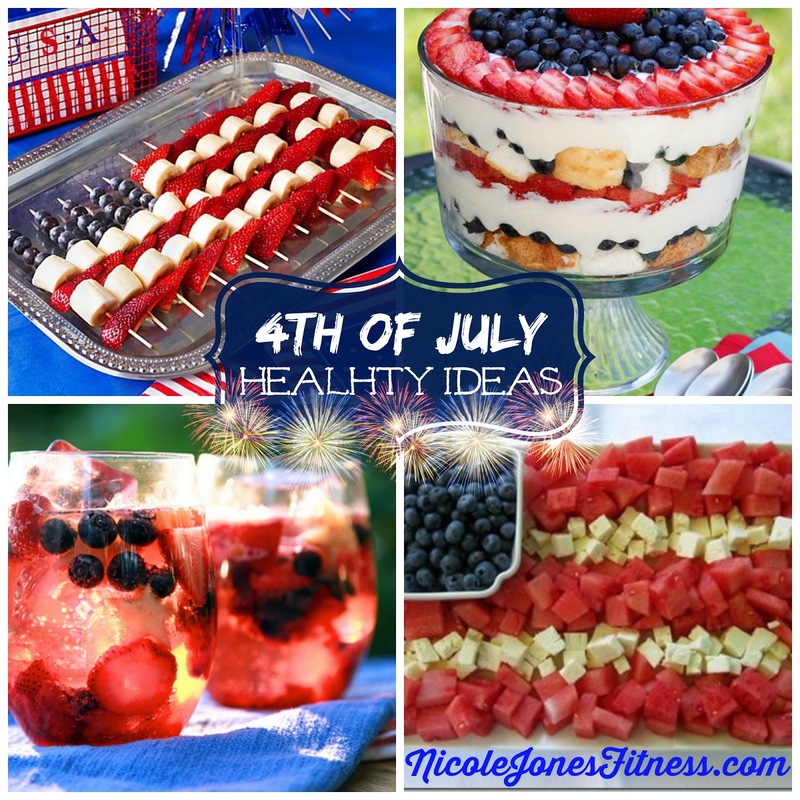 Headed to or hosting a 4th of July party this week? Here are 4 healthy options for you! Fruit Kabobs are a great option. Easy to make and festive looking! Makes for a great kid project as well. Simply layer strawberries, bananas, and blueberries or blackberries. Dessert doesn't have to break your calories! Try a simple layering of angel food cake, whip cream, and red/blue fruits for a beautiful dish. This is a household hit every year for me. Want to make a festive drink? Place a few strawberries, blueberries, and chunks of pineapple in a glass. Muddle the fruit by mashing it with a wooden spoon. Get your cups, toss in ice cubes, bits of your fruit mix, and top with a ginger ale! For another flag dish, simply cube red fruits, cheese, and a dish of blue fruits.